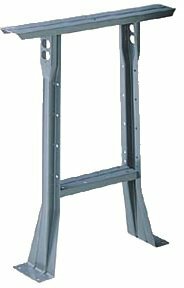 Nexel Fixed Leg For 30"W Workbench ● 30"W x 32"H ● Gray finish ● Features double electrical knockouts for installation of a hard wired electrical outlet, front and back ● Steel construction ● Nexel’s legs are punched for tops, stringers and shelf attachment ● Base plate allow floor anchoring ● Mounting hardware not included with legs ● Nexel offers a wide range products such as shelving units and parts in many different finishes and sizes. Also offers several accessories (baskets, hooks, ledges, etc. ), which can be purchased separately and extend the usefulness of your shelving unit ● Photos may not reflect advertised size. If you have any questions about this product by Nexel, contact us by completing and submitting the form below. If you are looking for a specif part number, please include it with your message.